Great side dish for picnics or patio parties, or perfect for light lunch during hot days. 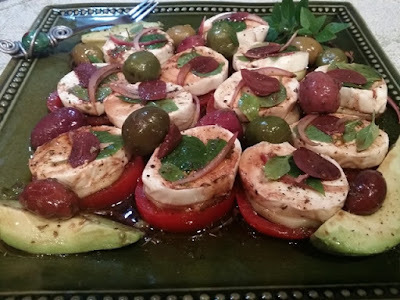 Use Mild or Spicy Italian Steve's Gourmet Olives . Makes 3 - 4 servings. Dressing makes good bread dip too. Prepare 30 minutes before serving . In small bowl - combine all ingredients for dressing. Mix well. Drizzle dressing generously over tomato platter. Scatter slices of avocado, onion and Steve's Gourmet Olives around platter. Using a spoon, baste everything on platter with dressing to thoroughly coat ingredients. Garnish with additional basil and garlic slices from olive jar.